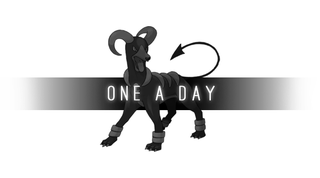 Heaven's Horror...Houndoom! Pokemon One a Day, Series 2! 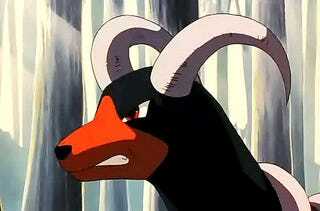 Okay, the corgi was fun and cute joke...But Houndoom is all grown up, ready to take down the wielders of light! Yes...Today is Pokemon x Kingdom Hearts! KH is a franchise I love despite all of it’s dumbness scattered in between. I was the target audience when it first dropped, and I took all the light/darkness stuff very srsly. The devilish dog was a perfect candidate to dip into the stylings of Tetsuya Nomura! There are better Pokemon to go “Heartless-ify” but of this remaining batch, Houndoom is the clear and best choice in my position. The dark disposition screams it and I had to answer. I pulled up references of other Heartless and made a board I could mix and match features from. From there, I worked up the details of the existing Houndoom and also used inspiration from MegaHoundoom to further the aggressive look. I replaced the “skull” pendant with the Heartless symbol, and added ears to the creature because it always felt weird that the metallic horns replaced them in the original. I changed up the design of the horns to allow doberman ears (aka the batman ears lol) sit on top of the head while creating a sort of pseudo helmet to give a vicious bite to match the bark of the Pokemon. I tried to find a place to add flames to really amp up the devil element, but wasn’t successful. I considered maybe having them hover around the tail or even replace the metal horns with flaming ones, but none worked. Instead, I worked more reds and oranges into the eyes, which are normally a pure yellow in traditional Heartless entities. KH does have a peculiar style but I didn’t really go for replicating so much but to finish a work and make it look nice and tidy. With that said, that wraps up the artwork and it’s on to the next one. Thanks guys...Hope you enjoyed this work! Brian White actually wrote his Game of the Week on Kingdom Hearts, so check that out as well! Game of the Week-Two Great Tastes that Taste Great Together? QOTD: Create the Devil’s Pokemon army! Get creative and use dark and fire types sparingly! Learn more about the artist, Bonny John, at www.bonnyjohn.com !